Apparently my desire to learn the breads of my childhood does NOT impress my classically trained chef-instructor who has a passion for the natural fermentation process. 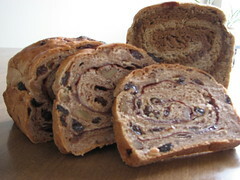 I am excited about cultivating yeast and making artisan bread, but a well-rounded bread intensive would not be complete without some marble rye and cinnamon raisin swirl bread. So begins white trash day, much to the chagrin of the Chef. But what fun! The cinnamon swirl was a favorite of husband and the marble rye was perfect to showcase my homemade sauerkraut and tempeh. There’s room in my world for the artisan breads and white breads to live in harmony. These breads have a basic bulk proof with active dry yeast and no pre-ferment. 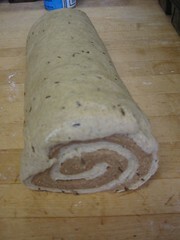 The marble rye definitely looks like it’s hard to make, but it was quite simple. The light and dark doughs had the same ingredients, except for coffee extract/food coloring/caramel color for the darker one. All I did was roll the dough out after its proofing, then roll the other one, sandwich the dough rectangles and roll towards me, lengthwise. Bam! A loaf of dough. At school we have lots of fun pans so we got to use the pan that is the size of a loaf of bread. Short proof in the pan, then bake and cool and eat. Totally demystifed. The cinnamon swirl bread was kinda like the marble rye, just one layer of dough…coat with butter and cinnamon and sugar, roll lengthwise, proof in pan and bake. I hope I didn’t ruin the magic, folks. 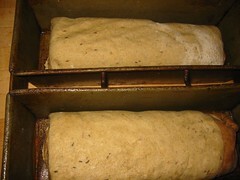 Marble rye in the loaf pan. To be complete in our day’s theme, we made cracker bread. 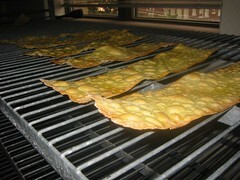 Also known as lavasch, cracker breads are sort of the precursor to Saltines. Same crunch and thickness, they are yummy but have a very short shelf-life. The next day they are stale. 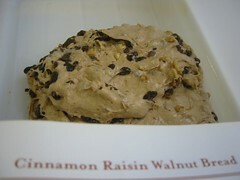 Luckily, the dough keeps just fine wrapped and refrigerated. Then it’s easy to bake just what you need. Our cracker was exciting because it was filled with rosemary (luxury!) and semolina flour. Semolina is (durum or hard winter) wheat that is coarsely ground to the size of grits. It’s popular in pasta dough and pizza dough. The grind gives pizza a nice crust, and helps it from sticking to the peel. We were blessed in that our school has a sheeter so we don’t have to roll it paper thin by hand. I wouldn’t mind it another time , but by using the sheeter we had more time to learn. The crackers just get rolled out and baked. There’s no yeast in it, so the only leavening will be if there are bubbles in the dough. Once they were to the golden level we liked, we pulled them from the oven and brushed it with olive oil and seasoned it with Kosher salt. Yum! To give the day a kink in its style, we made crumpets. We followed a James Beard recipe, and ended up modifying it. Crumpets remind me of English muffins but pancakier. The batter looks like pancake batter but is cooked in little molds. You can cut out both sides of a tuna fish can and that’s the perfect size. 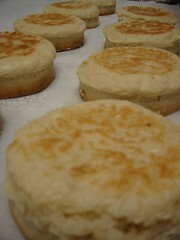 We used little open tart molds to cook our crumpets. I like crumpets because they are doughier than English muffins and have nice pockets on the top for filling with maple syrup or nutella or jam. I have also discovered that you can re-heat them in the toaster and they still taste fine. 1. Mix milk, yeast and sugar in a small bowl. Let it sit 5 minutes until it is frothy. 2. Sift flour and salt in a large mixing bowl and create a well. 3. 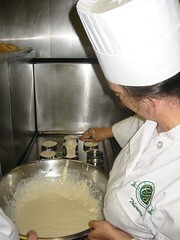 Pour yeast mixture into well and whisk until well combined. Cover bowl and let it sit in a warm place for an hour. 4. Heat your griddle/frying pan and add butter. Once melted, place the forms and allow them to heat up. 5. Fill each mold about 3/4 to the top and cook on medium heat. 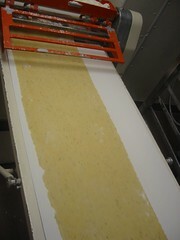 Once the top is dry and full of holes (past pancake stage), remove the mold and flip the crumpet. Cook to your desired color and remove from heat. 6. Fill with butter, sugar, nutella, jam and eat! Love the title. = ) The pics are amazing, and I completely support white trash bread, especially when it looks that pretty! Thanks, Bridgid! I’ll never turn my back on my white trash bread roots.